Primary English tuition by Teacher Linda for Yishun at 664 Yishun Ave4. ex MOE Teacher Linda will get the results for your child, with a comprehensive and effective English programme for the Primary tuition in Yishun with teacher Linda’s English Materials provided at our tuition centre. Call Yuet Ling +65 88231234 for our latest availabilities. Best Yishun English Tuition for Primary 5 by ex MOE Teacher Linda. Small group tuition at our 664, Yishun Ave 6 tuition centre, our English tuition for Primary 5 are in accordance to the latest SEAB MOE syllabus, with a class of 8 pax and with English materials provided, prepared by Teacher Linda. Master a language for life. Ex MOE Teacher Linda has a track record of improving students’ English with enjoyable lessons and proper tricks and hints to do well in their school. Mastering English as a first language with Teacher Linda includes all facets of learning the language, with a curriculum carefully crafted to help students to understand their lessons. Being proficient and grasp the intricacies of the English language during eduKate’s English lessons, Teacher Linda takes the fun efficient approach. Get the students to learn in a light hearted environment, converse their learning with a good repartee with fellow classmates and our students will have a clarity of word usage, develop the right narrative and be able to project their thoughts in proper. eduKate Tuition Centre provides our own materials prepared by Teacher Linda. Welcome to eduKate Yishun English Tuition Centre with our Yishun English tutor with 20 years in the business helping Yishun students to improve their ability to communicate and their linguistic competence in both the passive reading/listening and active speaking/writing process of the English Language. Different themes and ideas will be presented to our Yishun English tuition students, with constant updates to keep our topics relevant. One of the ways to have students develop a good command of language is to be able to keep students interested in their field of interests. Understand how English can be used to learn more of what they love, be it science, math, their hobbies, etc. The idea is to help them acquire their distinct set of vocabulary/lingo that they can use to learn, then grow their English mastery henceforth. Our main aim is to teach Yishun students critical thinking and perform in their examinations. They will acquire the skills to effectively communicate their ideas and understand the ideas presented in their MOE English syllabus examinations for both the Comprehension and Composition sections. A section of our English lessons are focussed on widening the general knowledge our students to comprehend the ever increasing complex ideas required to present a well balanced and well informed answer needed in the examination. With that in mind, our Yishun English classes are geared to teach and train our students to be able to understand the media that they read or hear, and to have the ability to express and communicate their complex thoughts and ideas to others naturally. Any improvements in information absorption and dissemination will automatically translate to cognitive skills and ultimately, help students to do well in their studies. English should be treated as our native language, to be the main Lingua franca for a cosmopolitan Singapore where over generations, English has been integrated well into our everyday life. As a first language, the focus of our tuition will be to task our Yishun students to learn the skills needed to communicate proficiently for both their studies in school as well as for their everyday life. 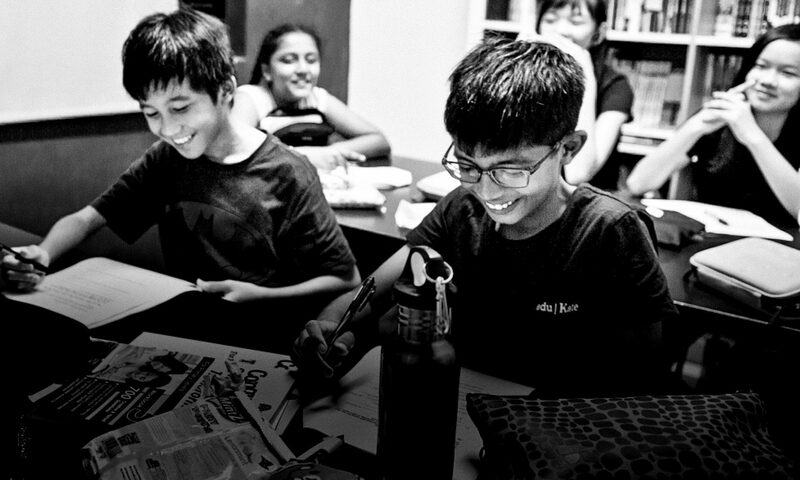 Our Pri 6 English tuition, with homework being marked and corrections cleared during class.